Hotel Residence Sveti Stefan is an intimate four star hotel in a little hamlet on the Budva Riviera called Przno, just around the corner from Sveti Stefan. 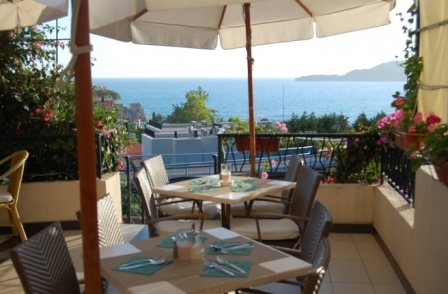 It’s the perfect location for you if you’re looking for somewhere that has that wonderful Mediterranean fishing village feel, but that’s also close to the action. I think this hotel is especially ideal for couples. Przno lies just south of Budva on one of the prettiest parts of the Montenegrin coast. The little hamlet is based around a large cove which has beaches, restaurants and hotels. It’s the perfect place to enjoy lazy days soaking up the sun and enjoying candlelit seaside dinners. Click on any picture to open the picture gallery. 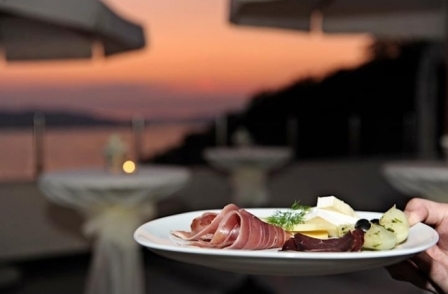 Although Hotel Residence Sveti Stefan has a fantastic restaurant of its own, Przno also offers some gorgeous little seaside konobas which serve traditional Montenegrin fare overlooking the sea. The beach and these restaurants are just a 10 minute walk from the hotel so you needn’t worry about driving home after dinner. If you want to go to Budva and maybe check out some of the famous Budva nightlife, you’re just a 10 minute drive, taxi or bus ride from town. 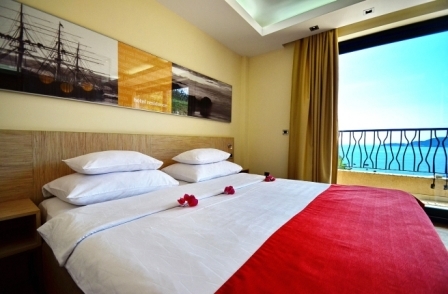 The spacious standard rooms come with either a mountain or sea view. 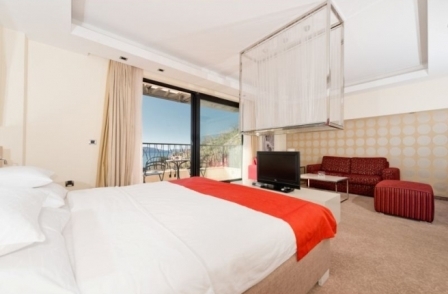 The mountain view rooms are little larger at 31m2 and sea view rooms are 20m2. In a location like this, where you have the idyllic village just below you, a sea view room is the way to go. The rooms also have tables and chairs and a desk area which makes them ideal for business travellers. 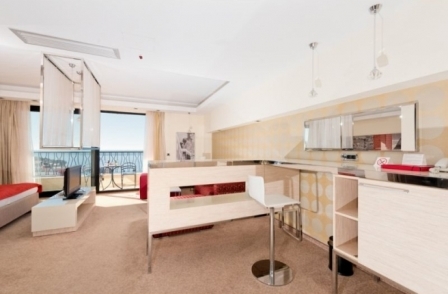 The junior apartments are perfect for you if you want a room with a bit more space or if you’re travelling with kids. These rooms have either twin or double beds as well as a fold out couch that gives you a comfortable seating area. 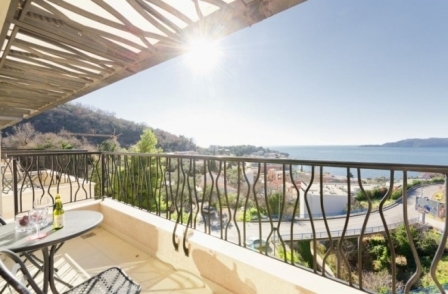 The apartments are 45m2 and come with the added bonus of your own balcony overlooking the sea or garden. 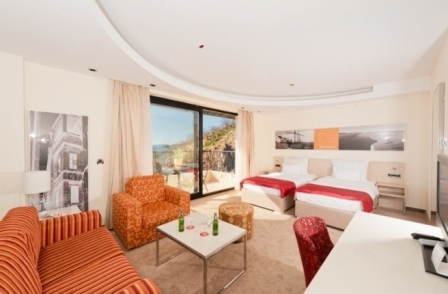 The sea view rooms are perfect for those stunning Budva Riviera sunsets. The garden view rooms will be a bit cooler in summer because they're shaded from the sun. The junior lux apartments are very spacious and comfortable at 55m2. They come with a double bed and seating area which has a fold out couch suitable for either one adult or two children. This apartment also has the option of interconnecting with a standard room if you’re travelling in a group. Hairdryer, cable internet, WiFi, cable tv, safe, robes, minibar, room service, laundry service, phone, air-conditioning and free parking. 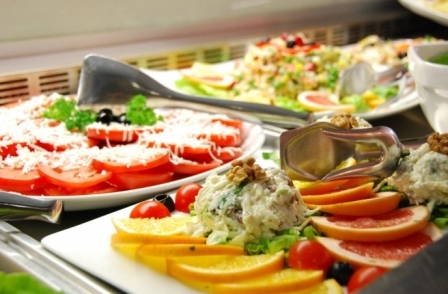 Hotel Residence Sveti Stefan is owned by an award-winning international chef – so you can be assured the food in this hotel is top notch. There’s a choice of the main restaurant or Breeze Bar. The Breeze Bar is on the rooftop of the hotel overlooking the sea – it’s perfect for cocktails and lazing with a book. The hotel’s plunge pool is also here on the rooftop so you can cool off if it gets too hot! The hotel has a rooftop plunge pool. It's great for a cooling off or for hanging out in while you sip on cocktails and enjoy the views. The downside is it's not very big. But there's a rooftop bar there, so it's great if you don't feel like going down to the beach. 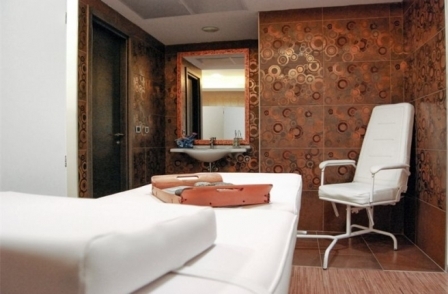 Hotel Residence Sveti Stefan has a small wellness centre which offers massages and beauty treatments. I have to say, few things are better than a good massage after a salty day on the beach or a day's sightseeing. I really like my hotels to have at least massages on offer. The hotel has two conference rooms which fit up to 100 people and all the equipment needed to run a business conference onsite. 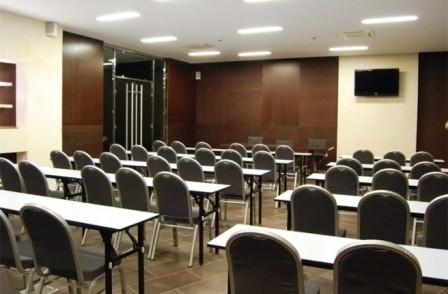 Montenegro is the location of choice for all kinds of conferences in the Balkans and with everything needed onsite, this hotel is the perfect place to hold a conference. 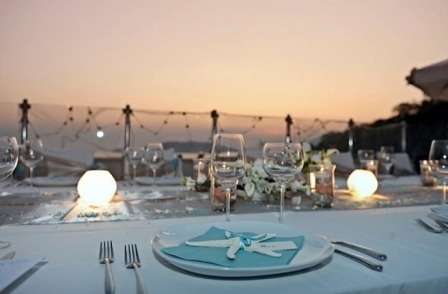 Would you like to get married on a rooftop overlooking the sea? 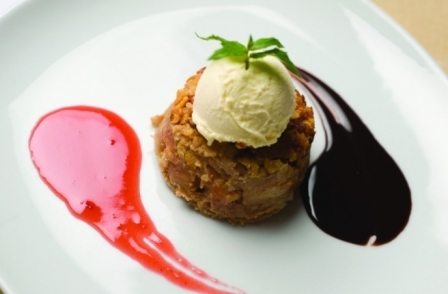 The special menu, pool and rooftop setting at Hotel Residence Sveti Stefan couldn’t be more perfect for a summer wedding. This is a beautiful and stressless way to tie the knot! Find out more about their events facilities on their website. Standard rooms start from €49 per person per night. Junior apartments start from €59 per person per night. Junior lux apartments start from €69 per person per night. 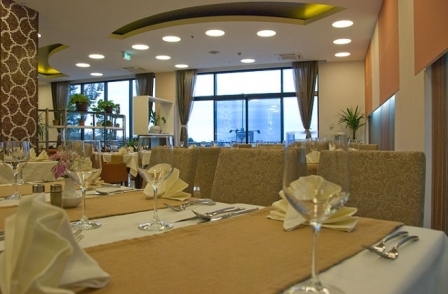 This hotel is a good hotel option for people who want a good quality hotel that's not too big. There are 30 rooms in total, making it more of an intimate hotel experience. The hotel is definitely best suited to adults over families. This makes it a good option for people who are looking for a hotel where they won't be surrounded by lots of kids. For families, it would suit people with older kids because there aren't any onsite activities for them and the beach is a 5-10 minute walk away. This can be a hassle if you're lugging preschoolers and beach equipment down to the beach several times per day.